It’s time again for Secret Recipe Club! What is Secret Recipe Club, you ask? It’s a club of food bloggers split into 4 groups that post on separate Mondays in the month. Each blogger is assigned a blog secretly and they stalk that blog to find a recipe or two to make. Once made, the recipe is photographed and a blog post is made to showcase the recipe and blog on the designated Monday! It’s a really fun way to find new blogs, try new foods, and share a little love to a blogger. For more information, go here. This past month has been absolutely insane for us and this last weekend in particular has definitely been the busiest. I’m typing this from our first home – our new home – which we are in the process of unpacking and settling into. But I’m proud to say that I made two recipes from my assigned blog, Flying on Jess Fuel. I’m sharing one of the two today for reveal day, but I loved both of them and will eventually get around to sharing the Cinnamon Pecan Banana Pancakes at some point. Jess is a Navy wife and also married to a Nick - both of whom love food and a good homebrew - which they definitely have in common with me and my Nick (except for Army instead of Navy). I have been waiting as patiently as possible and not rigging assignments (which took self control, let me tell you, since I'm the one that does them) to get Jess' blog. I love it! Jess has an incredible collection of recipes and her pictures are gorgeous. I had both a hard and easy time picking a recipe this month. I saved a bunch, but I easily picked my top two and made both. 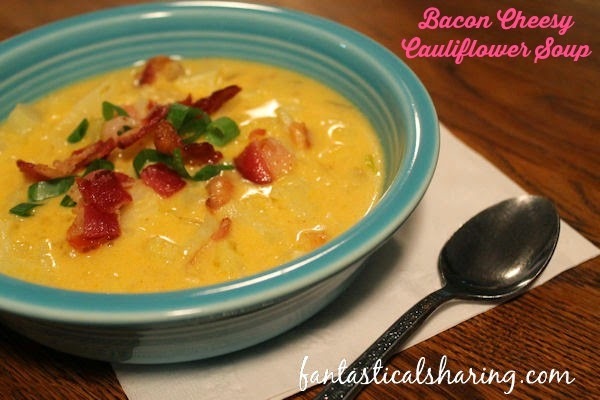 The one I'm sharing today is not the pancake recipe that I linked to above, but Jess' Bacon Cheesy Cauliflower Chowder...which my preggo brain inadvertently turned into soup while editing my picture...but it's chowder. Promise. Whisk flour and 1/4 cup chicken broth in a measuring glass; set aside. Cook bacon in a soup pot until crisp and drain on a paper towel. Reserve a little bacon grease in your large pot. Add onion, celery, and garlic plus salt and pepper to taste and saute for 4 to 5 minutes. Add cauliflower, stir, add water, and cook until cauliflower is fork tender, about 5 to 7 minutes. Slowly whisk in flour & broth mixture. Reduce heat and simmer until thickened. Remove from heat and stir in 2 cups cheese and half the bacon. Season with salt, pepper, and hot sauce. Serve topped with reserved cheese, bacon, and green onions.